“e-SOLO-e” (絵揃) is a Japanese word that means "match symbols". Mitsuo Yamamoto, LOGY GAMES creator, invented this game in the summer in 2015. His idea was to use cube-shaped pieces with 3 different symbols on the cube faces. 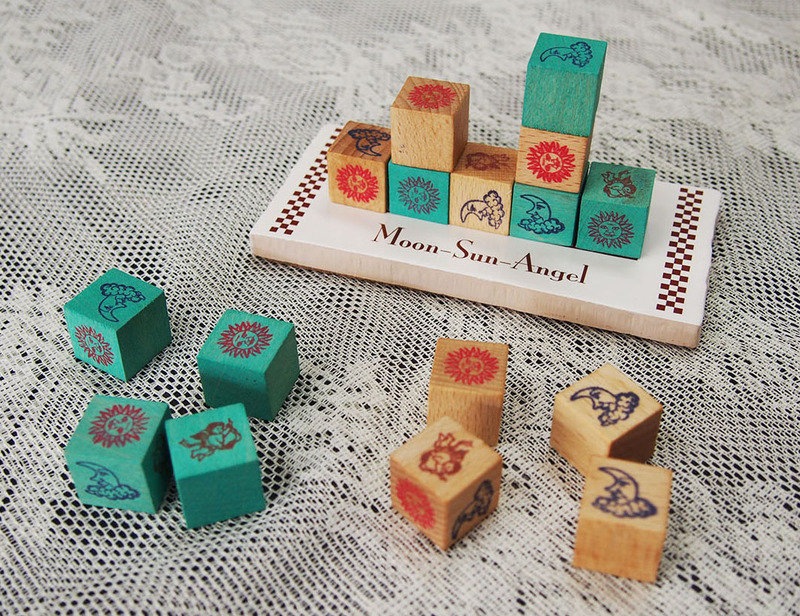 Originally the game was titled Moon-Sun-Angel. 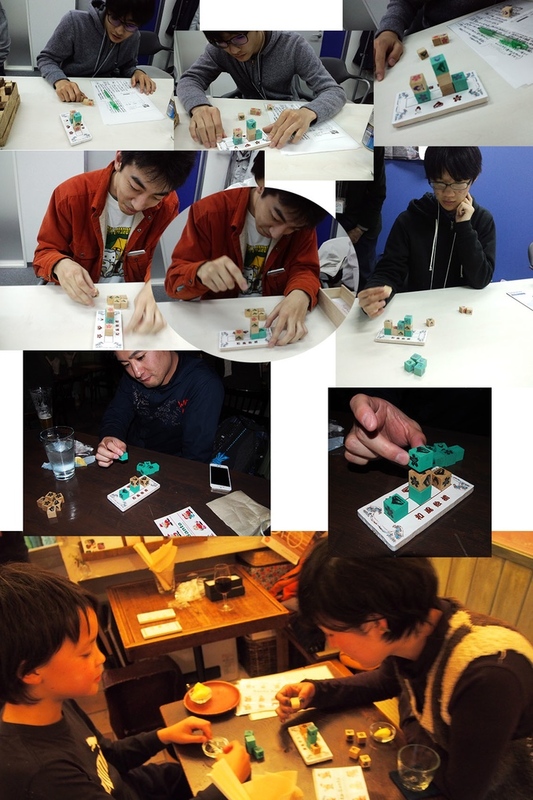 We made several prototype copies and attended the Tokyo Game Market 2015. All of the copies were sold out due to their great popularity. In an effort to gain popularity in the gaming world, we have decided to redesign the game look and feel. Inovative version is more compact with new attractive symbols. The compact size is perfect for taking the game anywhere and playing anytime. The new theme-based symbols make the game a beautiful and fun conversation piece for your desk, living room or collection case. e-SOLO-e makes a great gift for the active gamers on your shopping list. Each player has their own 8 color cubes. There are symbols printed on three faces of the cubes. The other three faces are blank. There no cubes on the board at start of the game. Players take turns and make one move at a time. Each player alternately places one cube on any square or on a cube already placed. Each cube must be played with a symbol face-up. 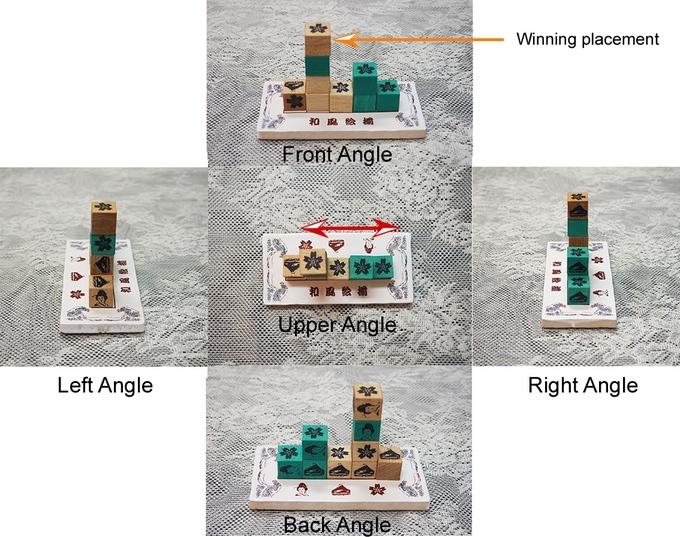 Cubes can be placed up to 3 stories (storeys) high except that a player can place a cube at 4 stories (storeys) high on the final winning play. To make 4 in-a-row with the same symbol regardless of the pieces' color: either horizontal, vertical or diagonal. Four Symbols in-a-row disregards which player's pieces make up the 4 pieces.